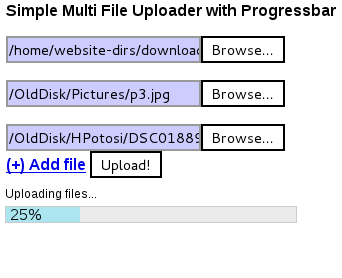 Have you been looking for a simple PHP Multifile uploader script? Since version 5.4 PHP brings all the features to implement this fairly easy. No add-ons like APC are needed anymore. The script presented here can be used for multi- and single file uploads. It is really easy to install and therefore ideal for everyone who does not want the to figure out the built-in features of PHP. To install the script you simply have to copy the files: php-multi-file-upload-script.php progress-frame.php, style-progress.css and upload.php in the same directory of your server which supports PHP > 5.4. After that the script should already work and you can customize the layout for your needs. Do not miss to set file_uploads to “On” otherwise PHP will winge. After you went through these steps the users of your website can enjoy fast and straight forward file uploads. Especially if larger uploads are required for your project your users will really enjoy the presence of this progress bar. Otherwise the might be to impatient to wait for the file upload having finished.